Having devoted my last blog to a species that’s pretty widespread and creepy, I decided to write about one of nature’s oddballs in my blog today. Perhaps it’s just that its name is one of my favourite words in the English language, or maybe its rise to “TV fame” in the wonderful Blackadder series (BBC) is the cause for aardvarks having a special place in my tender, animal loving heart. Aardvarks are nocturnal, creatures of the night that live a solitary life in the grasslands, open woodlands and forests of Africa. They can grow to between 1.0 to 1.60 meters ( 3 to 5ft.) and can produce one to two offspring per year with a gestation time of seven months. The aardvark’s favourite food are termites and ants, which it digs out with long, sturdy claws on its front legs. Termites live in huge colonies. They are nest building and master builders of bizarre mounts that litter the African landscape. Having sniffed out the location of a mount, the aardvark rips open the nest with its spoon-shaped claws and laps up the termites with its sticky tongue, which can be up to 30 cm (12 inches) long. Aardvarks only have teeth in the very back of their elongated jaws with which they crush the insects they munch. These teeth never wear down and are regrown constantly, but they do not have a protective shield of enamel. The aardvark lives in burrows, where they can disappear without a trace, when lions or leopards come to hunt them. The aardvark is distinctly odd in appearance with its sad, elongated donkey face, hare-like ears, soulful eyes and pig-like body. It has a long tail to balance its stocky body and powerful front legs for digging. It is also the only living member of the order Tubulidentata, an ancient species that evolved from very early hoofed mammals. It belongs to the family of the Orycteropodidae and can feast on up to 50,000 insects in just one night, making them one of my favourite animals…as you know, I’m not fond of bugs and buzzing insects! Reading up on this solitary creature that crosses the African plains zigzag style to sniff out prey, I was reminded how writers are often solitary creatures with little to recommend themselves at first glance, too. Endearingly eccentric, the writers I’ve met over the years were typically observers of life rather than participants. 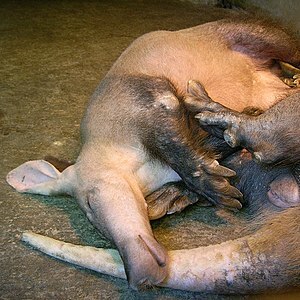 While the aardvark has a thick skin with brown bristles and is vulnerable to few predators, writers have a thin skin and are constantly threatened with “annihilation” thanks to well meaning friends and family members, self-appointed critics, editors, literary agents and the publishing industry as a whole. Who hasn’t secretly cursed their friends and family for “not getting the point” of one’s writing or for undermining one’s fragile confidence in a new writing project? 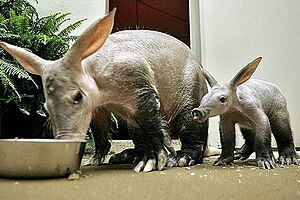 Undeterred by lions and other literary predators, the aardvark’s hair-lined nostrils sniff the ground for tasty termite morsels, just like a writer sniffs out good subjects to write about. Such subjects might not appeal to literary agents and publishers because they don’t look “commercial” at first glance, but as history has shown time and again, the reading public are always happy to embrace a good story, making a mockery of “the experts’ judgement” every time. The humble aardvark defeated the streetwise Blackadder – a comforting thought for this writer…whose heroine Willow the Vampire is not a cuddly kid with cute redeeming features for literary agents to fall in love with! NB: several of my older writer friends have received this ageist feedback – as if Mary Wesley had never published the Chamomile Lawn and a whole series of other books at the youthful age of 78! Thank you! I was so pleased that there was such a cute picture of them on Wikipedia/Wordpress. Utterly adorable…like many writers…grin.